Introducing the Waring commercial electric 3 cup power grinder. It comes apart and goes back together in seconds. Simple, 2 button operation. High performance, 1hp motor. Tight sealed so nothing escapes. 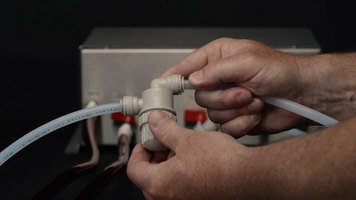 Safe and easy interlock lid. The grinder comes with 2 stainless steel grinding bowls and storage lids. Grind rock hard spices to dust in seconds. Blend sauces, rubs, flavored sugars, and nut butters, and make perfect whipped cream. Waring's two touch operation is easy. Press start/stop for hands free continuous-on grinding action. Durable stainless steel blades cut through just about anything you put in the bowl. Press the pulse control for a quick burst of power. Pulsing ingredients offers precision control to achieve the desired consistency. Getting started is easy. Place the bowl on the base and lock into place. Turning it right to left so the Waring logo is centered. Add peppercorns. Put on the cover. Line up the tabs on the cover with the tabs on the base and twist the cover to the right to lock into place. The unique blade design grinds faster and more efficiently. Ingredients can be ground to any consistency. You control the grind. Check as you work, continuing until you have exactly the consistency you want, from coarse to ultra fine it's your call. The Waring electric power grinder does more than just grind. Prepare fresh pesto fast. Press start/stop to run continuous-on until fully incorporated. Plate it, and serve. You can even make whipped cream in this grinder! Add ingredients, put on the cover, press start/stop for continuous run. Quick and easy fresh whipped cream in seconds! Clean up is fast too. Remove the cover and the bowl from the base. Place the cover on a firm surface and very gently push the dull side of a skewer or toothpick through the cover's three small holes to push out the seal. Be careful not to pierce the seal gasket. To remove the blade, hold the bottom knob with one hand and use the other hand to twist the blade clockwise. Wash removable parts in warm soapy water or clean on the top rack of the dishwasher. Dry thoroughly before reassembling. Before next use press the seal back into the gap in the cover using the grinding bowl to push it firmly into place. Grind, blend, whip. These are just 3 of the things your Waring commercial electric power grinder can do. From peanut butter to pork rub to hummus this is a machine that does a lot more than just grind. Versatile and compact, this grinder from Waring will make a great addition to your kitchen! You can grind spices, make a sauce, or even whip cream quickly and easily using this grinder. With a 3 cup bowl, you can make individual servings of sauce or grind enough spices for your whole staff! 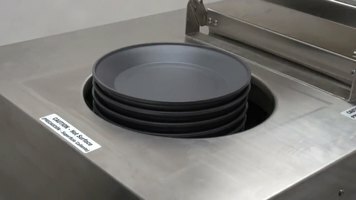 This video shows you exactly how the Cambro Camtherm pellet heater can provide you with an added boost of efficiency in your tray-line service! 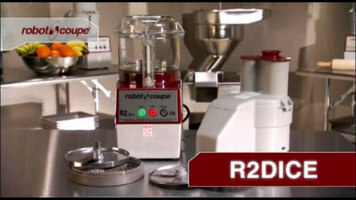 Watch as the Robot Coupe R-2 Dice continuous feed combination food processor goes to town on peppers, onions, and fresh herbs. This product will make producing large quantities of processed food a breeze!